Our friends at Children’s Ministry Deals have released a free lesson series for preteens (or upper elementary) students. It’s a 4 week Bible study that will help them trust in God when life gets messy. Just looking at the reviews, tons of churches have already used this and given it high marks. If you are struggling to engage this age group, this might be a great way to kickstart your preteen ministry. How to download: Simply click the link above to their website and click “ADD TO CART.” You will go through their checkout and enter the payment screen, but no payment is needed because this is a 100% free download. While you’re there you can check out the other free lesson plans and preteen Bible studies. This would be ideal for a weeknight program, but could work in Sunday School (if they are prepared to be messy). It’s packed with fun game ideas to keep the class involved in the Bible teaching. Includes resources for large and small groups. Bible Story: Abraham lies about Sarah. Genesis 20. 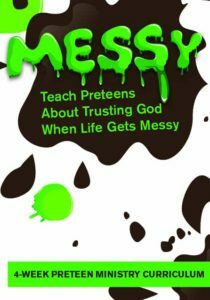 Preteens will learn how lies can make a mess in their lives. God’s word offers hope but it starts with the truth about our sin is what starts the mess in our lives. Bible Story: The fall of Samson. Judges 16. The class will discover how pride can cause a mess in their lives from the life of Samson and his frequent failures. Bible Story: Moses kills the slave driver. Exodus 2:11-22. Students will study how impatience can create a mess in their lives. Anyone working with adolescents knows this is a constant struggle. Bible Story: Jesus forgives Peter’s denial. John 21:15-19. 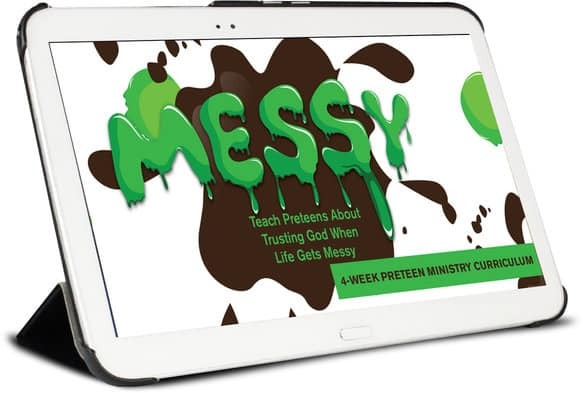 In the final lesson, preteens will learn how Jesus can help us clean up even the biggest messes. This evangelistic message is an important part of any good ministry teaching program. I’d love your feedback on this material, I’ve looked it over but haven’t had a chance to use it in my church yet. My next rotation in the Middle School Sunday School class and I’m going teach these lessons myself. Thank you Tony. God will increase you in wisdom and ideas for our sake. I pray that you excellent in every area of your service. I hope to adopt this teaching immediate in our children Sunday school. I’m praying you continue to help other like me dealing with children it inspire to reading . Hi, I just want to say thank you so much for sharing all that you have especially around children to people around the world. I am a 19 year old girl and I run a preteen class. And there are many times when I feel afraid of doing something different but you have given me so much faith in myself and this curriculum of Messy is something I am definitely going to teach them. Thank You so incredibly much! Much love from your sister across the seas. Tony Kummer (Editor) reviewed & updated this page on : August 9, 2016 at 9:51 am. All our content is peer reviewed by our readers, simply leave a comment on any post suggest an update.